This was a great week running wise – I skipped a run but PRed big time on Sunday (more about that in a future race recap). Anyway, on the this week’s half marathon training recap. 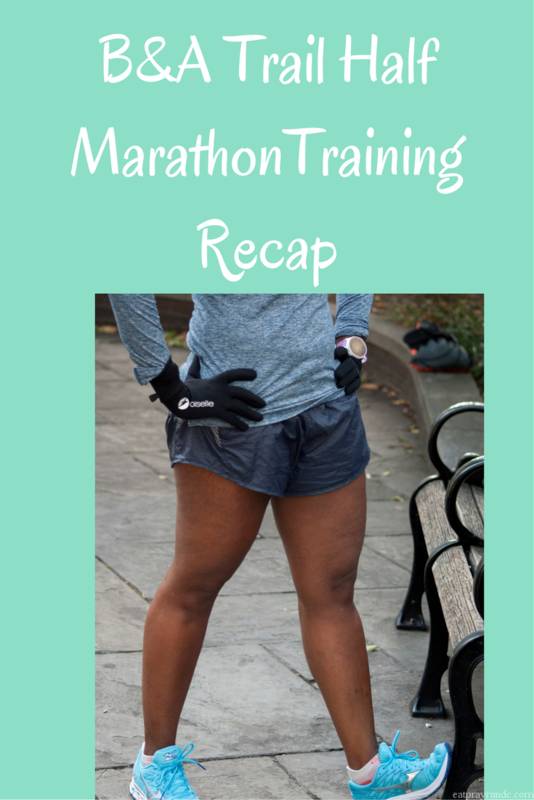 Each week during this training cycle (I’m training for the B&A Trail Half Marathon – a relatively small, rails to trail half in March), I will share how my training went and what the week looked like. I do this because: 1) I love reading about how other folks train and 2) it’s great for me to have a record of what I did each week. Also, honestly, it helps keep me accountable when I know I’ll be writing about it. I also post almost all of my runs on Instagram as well. I’ve started a weekly link up for Training Recaps – let’s support each other as we train this winter! Please do link up! Monday: 6.2 really rainy, windy and cold miles! Tuesday: 3×1600 out on the trail. Not an easy workout but I was happy to get it done! Thursday: I did something I never do. I skipped my run. I talked about it on Instagram and I think that picture said it all. Friday: Five easy miles before work to kick off the day. Saturday: Traveled to Phoenix for a team meet up with my Oiselle teammates. It was a long day, but no running. How was your week? Did anyone else race this past weekend? Congratulations on your half marathon and the PR! I remember reading when you were trying to break 2 hours for the first time and I think using Hansons and now you’re running so close to 1:50. I can’t wait to read your race report. It is A-OK to skip a run. Heck, it probably helped you with the travelling and the PR. Sometimes life happens and the run doesn’t… none of us are professional athletes or doing this for money so if your body or mind say NO, it’s better to listen. Plus, better to take a “mental health day” from running now than risk getting injured or mentally burnt out later on in the training cycle. Best wishes for training this week! Thank you – it’s funny to me to think that I just broke 2 hours less than a year ago! I attribute it to mostly to the Hansons plan! Congrats on the half marathon PR! I am looking forward to the recap! Hope you have a great upcoming week! Great PR! That’s a fantastic end to a week. I think that deciding when you should go for a run and when it’s ok to take a day off is part of balancing it. We all can’t be perfect and run every single workout we’re supposed to. That’s part of having a life outside of running, which is important! Congrats on your PR! I hope you had a great time in Phoenix. I’d say you still put together a pretty good running week considering you traveled and raced. Congrats on the PR! I miss running in the sun! What was that like, lol?!? Lisa @ TechChick Adventures recently posted…Training plan in action! Congrats again on your great PR! I’m glad I had the opportunity to meet you in person this past weekend. And I’m finally taking my first Barre class tonight. Eek! What a way to start off the year! Congrats on your PR! Can’t wait to hear the details! Thanks – I am glad I decided to go for it! Congrats on the PR, will look forward to reading your recap! Still sounds like you had a great week of running though! Congrats on your PR, what an amazing job! I love your IG post. Balance is so elusive…we just do what we can and keep pushing forward! Congrats on your half PR; that’s fantastic! I’m looking forward to reading your recap. Thanks Debbie – the sunshine was a welcome change from home! Thank you – and you are probably right. The rest definitely helped me run fast on Sunday! woohoo, congrats on the PR! Cant wait to read more about it! and thanks for the Instagram post, it made me feel better. That missed tempo run turned out to be a blessing; fresh(er) legs for that big PR on Sunday! BAM!